CLA Associate Dean for Diversity and Curriculum Featured in Cal Poly Magazine's "My 2017"
Jennifer Teramoto Pedrotti, associate dean for diversity and curriculum in the College of Liberal Arts (CLA) talked with psychology senior and CLA Student Diversity Committee member Marcos Ramirez-Santos about diversity initiatives that are shaping campus. 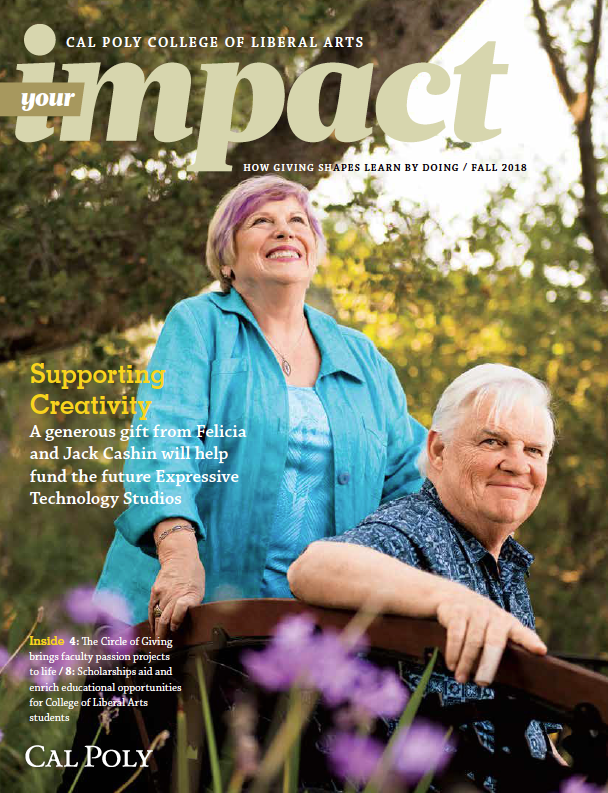 The video originally appeared in the winter 2018 issue of Cal Poly Magazine. Teramoto Pedrotti also wrote a letter for the magazine's "My 2017" feature, which included Cal Poly students, faculty and alumni sharing how the year challenged them — and changed their lives for good. As you began in January, I was also at a new beginning in my position as Associate Dean for Diversity and Curriculum in the College of Liberal Arts (CLA). It was not a quiet beginning for either of us. In the end of that first month, the college was getting ready to help plan a university-wide gathering with a goal to Unite Cal Poly. This was a daunting task for a new year and pressures were high. Coal starts out as only fuel, but with pressure can be transformed into diamonds, and as we moved through that first month, the pressures at hand began to create beauty in our university as well. My new position gave me a different vantage point from which to look at our campus as a whole, and I saw many challenges ahead for us. But challenge brings with it an opportunity for growth, and this could be seen from this new view as well. As the month went on, students came together to work on Unite Cal Poly, new relationships between organizations were created. Professors came out of their classrooms for the Teach-In and brought with them a wealth of information about race, gender, immigration and hope for our future with regard to diversity and inclusion. The beauty spread, as the campus came together and united in your first month. Throughout the rest of your year, we saw other changes, other areas of growth. New learning communities formed. We made plans for new hires in many departments. In the CLA we were hard at work, interviewing applicants for our cluster hire focused on diversifying our curriculum. Multiple presentations were made by these candidates, ranging in topics from Ethnic Literature to Queer Theory to Racial Identity Development in Children. Participants at the UndocuAlly trainings swelled in numbers, and real plans for our Dream Center began to form. Record numbers of students signed up for Intergroup Dialogues and other multicultural opportunities in our Cross-Cultural Centers, large numbers of faculty and staff participated in the Teach-In’s follow up, Teach On, and almost everywhere on campus you could hear the echoes of conversations about love, empathy and respect. When we came back in fall, it felt as if a shift had occurred on this campus. Welcoming our first Vice President for Diversity and Inclusion seemed like turning a corner for our campus climate. Not the last corner, for there is still much work to be done. But a new life was breathed into our hopes for a truly inclusive campus, and things felt different for many of us. 2017, you will go down in our Mustang history as a difficult year in many ways. One filled with rain at times, and even mudslides, but you will also be remembered as a year that we had in important choice to make: Would we choose to break apart because of these pressures or pull together and unite into something stronger? As a campus, we made the right choice in 2017. But that choice will face us again and we can only hope that the lessons you taught us this year will help us to move in positive directions as we move forward on our journey.